How much will a new website cost you? We have put together a package that will suit most of our clients. This package costs only £499 inc.
With optimisation in mind from the very start of any project we ensure that your site will not only look great and reflect your business in the professional manner that it deserves, it will also perform well and appear in search results. We provide free consultation at every stage of the project and will discuss all possibilities and options with you in a clear and friendly manner so that between us, we get the best site for you or your business. All of our sites are built using a tried and tested CMS. This enables us to provide excellent client facilities. You can log in and edit pages in real time to help reduce costs to your business, no need to pay for updates. 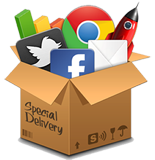 We can add and remove functions as you require them, i.e social media integration, galleries, online stores, etc. Some of our clients do not have the time or necessary skills to edit or maintain their websites but that is fine. We provide update and maintenance services at £30 per hour on an ad-hoc basis and can carry out alterations on a very quick turnaround, normally within a day. Netmagnetics is an informal friendly web development and management service. We are based in High Wycombe and have a growing list of happy local clients. Most of our clients have been with us for a number of years and we provide them with a cost effective service that keeps their business prominent and current. Our distributed storage systems give you peace of mind knowing that your website will always be online. We run regular backups and actively monitor all of our sites to ensure security and reliability. Our support contracts cover all issues that you might come across. Email problems, website availability, hack attempts, etc.